A good produced in a country other than the one in which it is sold. Imports bring money into the producing country and can remove money from the country in which the good is sold. For that reason, many economists believe that a nation's proper balance of trade means more exports are sold than imports bought. Some countries set up various trade barriers against imports, notably import quotas and tariffs. Most governments seek to promote exports, while they have differing positions on imports. See also: Free trade, NAFTA. A good or service brought into a country from another country and offered for sale. While some imported items originate in foreign subsidiaries of domestic companies, large increases in imports tend to hurt sales and profits of many firms located in the importing country. Compare export. See also balance of trade, quota. a good which is produced in a foreign country and which is then physically transported to and sold in the home market, leading to an outflow of foreign exchange from the home country (visible import). a service which is provided for the home country by foreign interests, either in the home country (banking, insurance) or overseas (for example, travel abroad), again leading to an outflow of foreign exchange from the home country (invisible import). capital which is invested in the home country in the form of portfolio investment, foreign direct investment in physical assets and banking deposits (capital imports). Together these items comprise, along with EXPORTS, a country's BALANCE OF PAYMENTS. See INTERNATIONAL TRADE, IMPORT DUTY, IMPORTING, IMPORT PENETRATION. Fig. 84 Import. (a) UK goods and services imports, 2003. 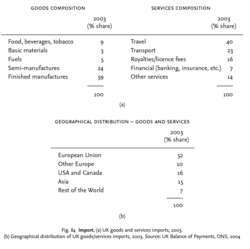 (b) Geographical distribution of UK goods/services imports, 2003. Source: UK Balance of Payments, ONS, 2004 domestic industries from foreign competition. See TARIFF, IMPORT RESTRICTIONS, PROTECTIONISM. together with EXPORTS, they make up a country's BALANCE OF TRADE. Imports must be financed (‘paid for’ in foreign currency terms) by an equivalent value of exports in order to maintain a payments equilibrium. On the one hand, imports are seen as beneficial in that they allow a country to enjoy the benefits of INTERNATIONAL TRADE (obtaining goods and services at lower prices), but on the other hand, as indicated by (b) above, detrimental because they reduce income and output. It is important to maintain a balance between imports and exports. Imports are beneficial, provided that they are matched by exports - i.e. ‘lost’ income on imports is restored by income ‘gained’ on exports to maintain domestic income and output levels, and, as indicated by (a) above, imports are financed by exports to preserve a BALANCE OF PAYMENTS EQUILIBRIUM. Fig. 84 gives details of the product composition and geographical distribution of UK (merchandise) goods imports in 2003. See Fig. 68 , EXPORT entry, for comparable export data. See BALANCE OF PAYMENTS, INTERNAL-EXTERNAL BALANCE MODEL, GAINS FROM TRADE, IMPORT PENETRATION, IMPORT RESTRICTIONS, IMPORT SCHEDULE, IMPORT SUBSTITUTION, PARALLEL IMPORT. 5 million), expanding faster than the two other components of capital importation. This importation is for the NFA's buffer stock,' he added. The documents indicated that the importation of live cattle from the state of Santa Catarina would still follow the conditions set by the OIE under its Terrestrial Animal Health Code. Infringed goods as defined under the Intellectual Property Code and related statutes, and all other items or parts whose importation are explicitly prohibited by law or rules and regulations are likewise prohibited under the CAO. Two WPV1 importation events and one WPV3 event in Angola, all originating from India, resulted in WPV transmission during 2008-2009. The report concludes by listing other CRS reports on drug importation. In 2002, these steps successfully prevented importation of WPV into Bangladesh and Nepal during a resurgence of polio in India. While some means of drug importation may be relatively safe, many transactions are occurring in poorly regulated and occasionally bogus Internet operations. The idea that our state legislature is considering allowing importation is troublesome," says Christopher Gauthier, chair of the Maine Pharmacy Association. The HHS-convened task force dismissed the idea of personal importation of drugs from other countries as being extraordinarily difficult and costly to implement safely. None of the legislation previously introduced in Congress would meet this criteria since most of it deals with personal importation of drugs, a senior administration official said in a teleconference announcing the release of the report. A limited commercial program that would import drugs from Canada is feasible but would result in limited savings for consumers, members of a government task force on drug importation said at a press briefing sponsored by the Health and Human Services Department.